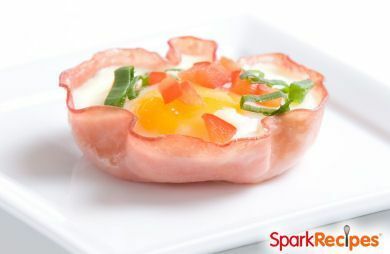 These adorable single-serving ham cups turn any breakfast into a special occasion. Feel free to jazz these up with your preferred seasonings. These adorable single-serving ham cups turn any breakfast into a special occasion. Feel free to jazz these up with your preferred seasonings. Spray 6 cups of a muffin tin with cooking spray. Arrange the ham slices so they line the muffin cup completely. The edges will stick up above the cup. Bake for 10 minutes. Remove from oven and break an egg into each cup, gently breaking yolk. Sprinkle with pepper. Return to oven for 10 minutes. Check the eggs. If they are done to your liking remove and sprinkle with cheese and chives. If not, continue cooking, checking every minute or so.